Happy Birthday, America; you don’t look at day over 200! If you are anything like me, than not only do you love a good themed part, but you also LOVE themed baking! I couldn’t resist baking up a little red, white, and blue breakfast to start our Fourth of July celebration. 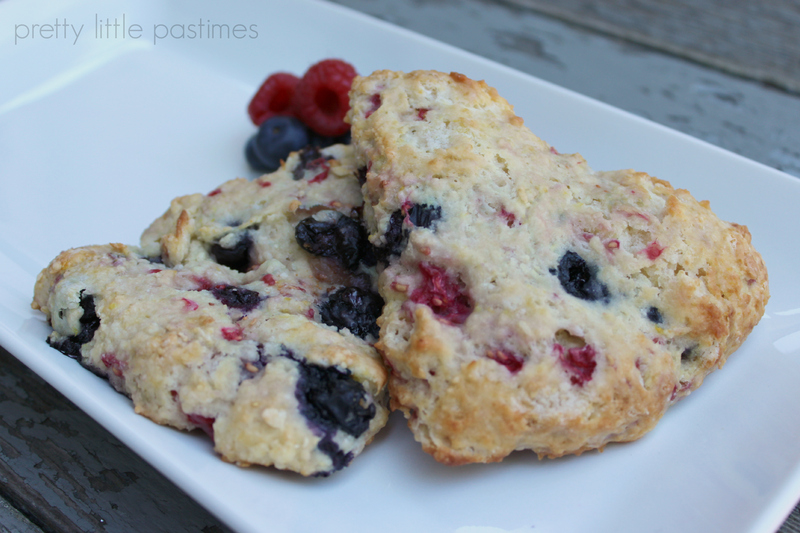 This was my very first attempt at making a homemade scone and it will certainly not be the last. They were flavorful, flakey, and just the right amount of sweetness for me. With a dollop of fresh whipped cream, I would also gobble one of these up for dessert. 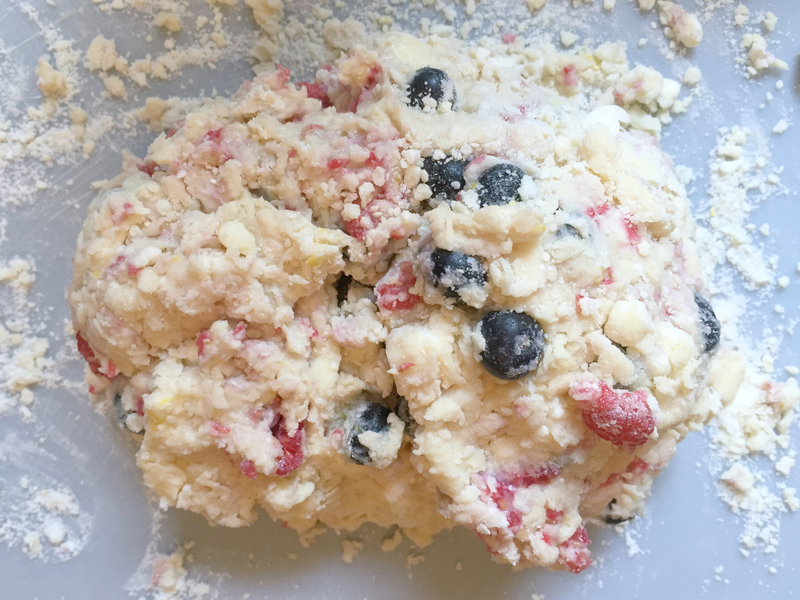 In fact, I am already thinking about different flavor combinations I can bake up in the future … orange blueberry, cranberry almond, chocolate-anything … yum! Preheat oven to 400 degrees. In a large mixing bowl, whisk together the flour, sugar, baking powder, and salt. Add the butter and cut into mixture. I use two forks to break up the butter and then my hands to further knead it in. Don’t worry about catching every small piece of butter, some larger pieces are just fine. In a small mixing bowl wish together the egg, sour cream (or Greek yogurt), vanilla extract, and almond extract until smooth. Pour the wet ingredients over the flour mixture. Fold until just combined, being careful not to over mix. Gently fold in the berries and lemon zest. Sprinkle flour onto your work station and turn the dough onto the surface. Knead it into an 8-inch round. If the dough is too wet to work with, add a little more flour. If it is too dry, add a small splash of milk. With a large knife, slice the dough into 8 equal sized pieces (like a pizza). Using a flat spatula, transfer the wedges to a baking sheet lined with parchment paper. Make sure dough is at least 2 inches apart to allow for the dough to spread while baking. Bake for 15-18 minutes or until very lightly golden. 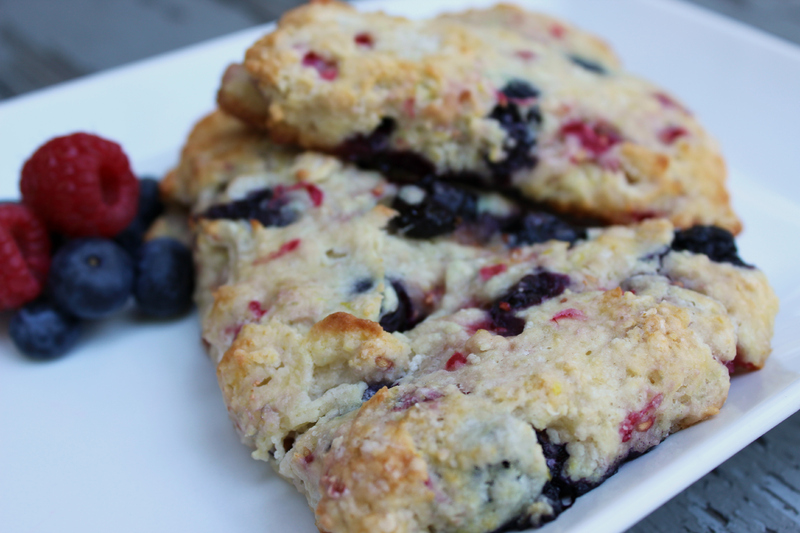 Allow scones to cool for 5 minutes and then transfer to a wire cooling rack. Once cooled (if they last that long), drizzle with a little all natural honey and enjoy! Wishing each of you a very Happy Fourth of July!